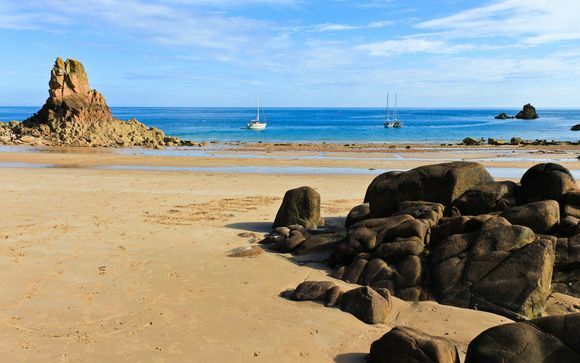 With unspoiled landscape and unique blend of British and French influences, Jersey really is a place where you can get away from it all. Relax and enjoy the famed hospitality of its people, and lose yourself in the Island's winding lanes or on its breathtaking coast. Culture vultures will discover history at every turn, walkers will be captivated by the Island's stunning natural beauty, and families can relax without a care on pristine beaches. It's also the ideal place to clear your head, indulge in some exhilarating outdoor sports, or simply live the life. 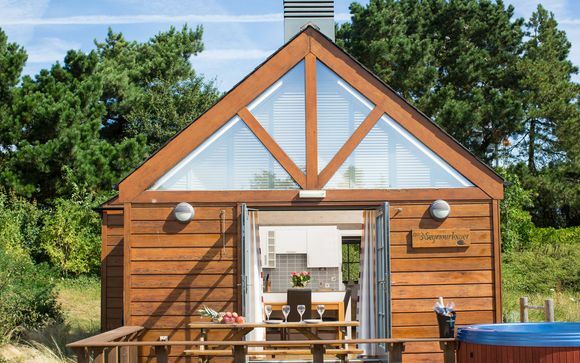 These self-catered lodges are perfectly located close to the best beaches, walks and cycle routes Jersey has to offer, whilst St. Helier is only a 15 minute drive away. The lodges are stylishly furnished, and each boasts its own hot tub and decking area. Clustered together in small groups, the lodges offer guests maximum privacy, whilst ensuring easy access to the many amenities. 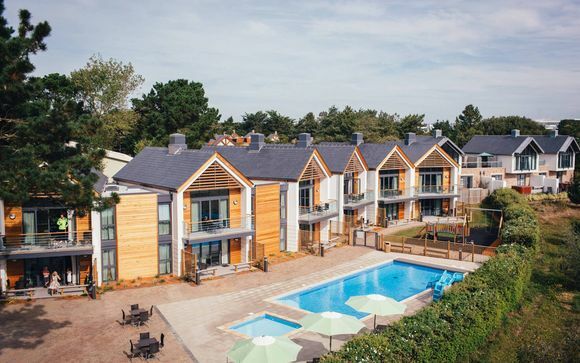 There is a wealth of activities on offer, including an indoor activities centre with a high ropes area, making Les Ormes Lodges perfect for families or young adults looking for an active getaway. This offer is based on a One Bedroom Lodge or a complimentary upgrade to a Three Bedroom Lizard Apartment. The Lodges all have their own hot tubs and al fresco dining decking, perfect for long summer days spent under the sun. 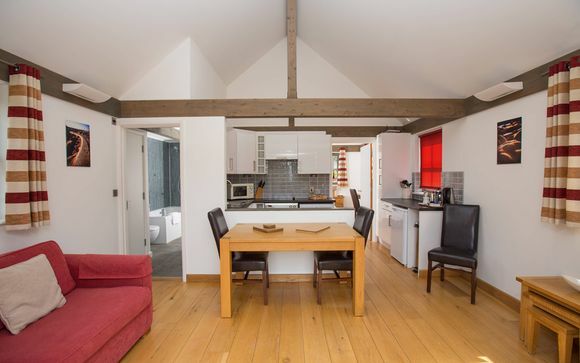 Designed to look a traditional Channel Islands fisherman's cottage they have an open plan lounge and kitchen area and one enclosed bedroom that can be set up as a double or twin. There is a double bed sofa in the living room which can accommodate adults if you prefer to put the children in the main bedroom. The bathroom can be accessed from the lounge and the bedroom and has a bath with overhead shower. There are flat screens TVs in both the lounge and bedroom. The kitchen is fully fitted with a full oven, dishwasher and washer dryer. Each unit its own bike rack and the lodge site is car free other than on arrival and departure days. 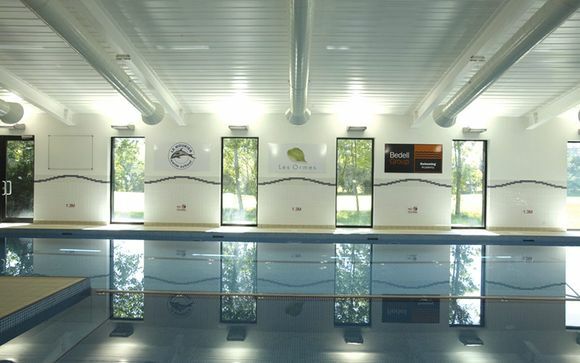 The lodges are situated conveniently close to all the facilities including the outdoor pool. The Les Ormes Apartments are the newest properties and have three bedrooms and two bathrooms. There is a master en-suite, a double/twin room and a bunk room. They have open living areas, full ovens and a veranda overlooking the golf course. They also have easy access to the outdoor pool. Love self-catering but hate cooking? You can book breakfast and dinner in the resort. Pop into the resturant for a spot of dinner on one of the themed nights or just for a glass of wine at the bar. The restaurant offers food and beverage packages that can be booked in resort. Les Ormes also offers free use of BBQ areas, the pefect choice for those long, summer days. Just for you: free weekday golf, free standby tennis, free gym use, free daily bike hire, outdoor pool, free beach sports at Jersey Marine Lake, kayaking and stand up paddle boarding. The hotel offers indoor and outdoor swimming pools, a health and leisure club with fully equipped gym, nine hole golf course with practice area and tuition available and four indoor tennis courts. There is also the Creepy Valley Adventure Centre, situated within the grounds, offering a range of exciting activities including climbing, high ropes, zip wires, aeriel trekking, laser combat, archery and king swing (charges apply). Absolute Adventures are also on site and offer a variety of water sports including coasteering, wakeboarding, kayak tours, banana and inflatable rides and RIB powerboat tours (charges apply). Flights: A range of flight options are available, for full details, please click here. Transfers: Ferry transfer from Poole to Jersey is included for members booking accommodation only, with Condor Ferries with a standard sized car. Car Hire: Car hire is included for members booking a flight inclusive package. The minimum age for driving a hire car in Jersey is 21 and drivers must have held a full driving licence for a least 1 year. You must present a full valid driving licence on collection of the vehicle and in some cases a credit card or cash deposit. Once the booking process is complete, you will receive an automatic confirmation email from Voyage Prive detailing your chosen travel arrangements.Your official ATOL receipt and booking confirmation issued by the Tour Operator will follow within 5 days.